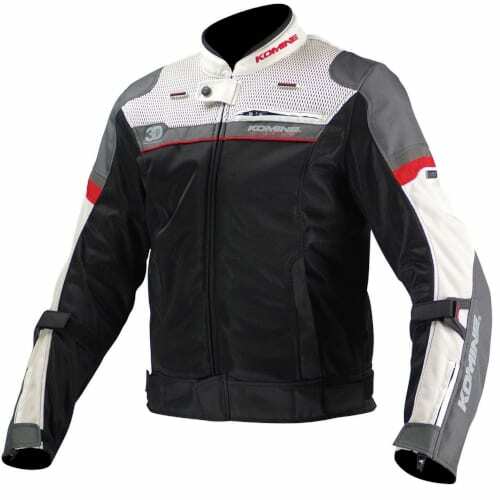 Komine JJ-001 mesh titanium sports motorcycle jacket is made in Japan at Tokyo Headquarters. Featuring excellent protective and performance features for summer riding ・Molded titanium outer shoulder armor & CE certified Elbow and shoulder inner armors, hard chest and back inner armors provide superior impact protection ・Stretch panels on articulation areas offer excellent level of mobility in riding position ・Premium quality of made in Japan YKK zipper used on the front ・Full circumference waist connection zipper allow attachment to PK-738 protect riding mesh pants ・Strategically positioned 3D mesh lining in the back protector compartment for maximum airflow. 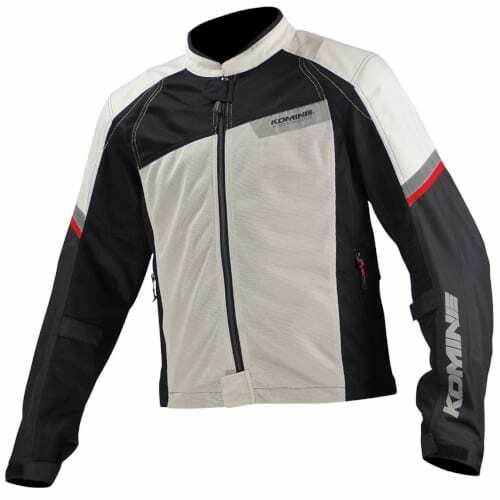 The Komine JK-014 Mesh Motorcycle Jacket LEGEND is a great, affordable option when it comes to mesh safety in mesh jackets. The CE elbow and shoulder protector come standard as well as a back protector. You also have the option of being able to add one of Komine's integrated liners, to the structure to give you longer season riding. With reflective qualities in built, this is definitely a jacket that offers safety, quality, affordability and flexibility in one package. The Komine JK-014 means you don't have to give away safety for price. 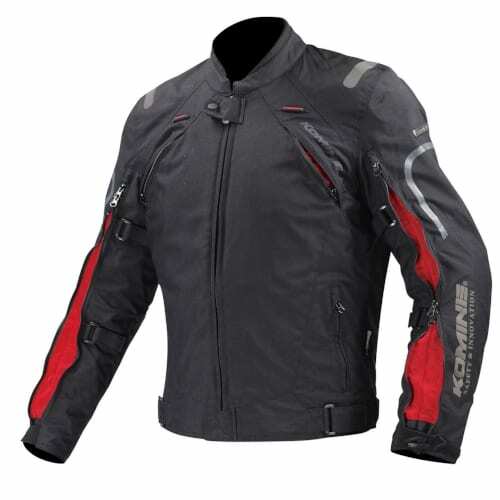 The Komine JK-109 Sports Race Mesh Motorcycle Jacket Syguen is a full protection sports jacket that is designed for a slim fit. It comes with CE level 2 protection in the elbows and shoulders as well as coming with chest and back protection included. It has 3d mesh lining for comfort and has the ability to upgrade to a CE certified back protector. 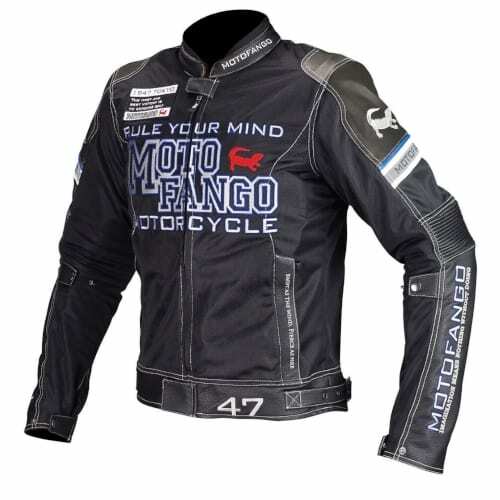 Good for riders who love the quality, protective racing style jackets. The Komine JK 107 Titanium Mesh Motorcycle Jacket is for the rider who wants to stay cool in summer but still wants safety. The extensive mesh material on the outer shell gives great breathability combined with the 3D mesh panels. Titanium sliders on the shoulders add to the CE shoulder/elbow armor and chest/back protectors as well as giving it a great look. The reflective panels help to be seen at night. 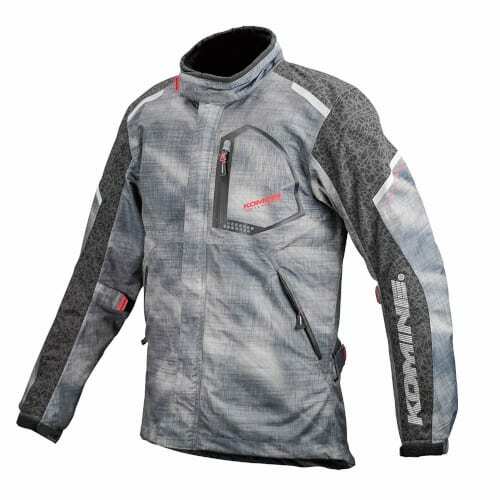 Komine's JK-107 is great for riders who want comfort and protection in a summer jacket. 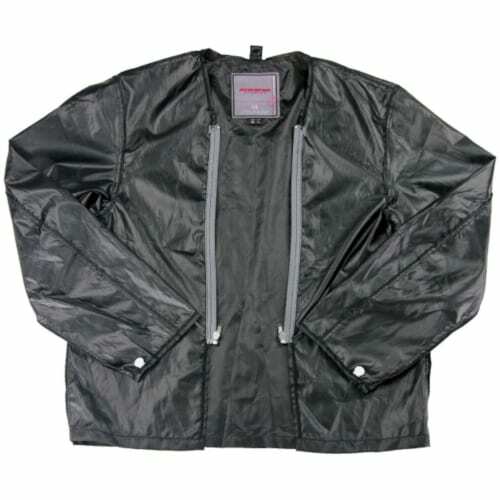 Komine JK-108 Air Flow Vented Motorcycle Jacket is a great 3 season jacket that can become 4 seasons if you add our additional liners to it. 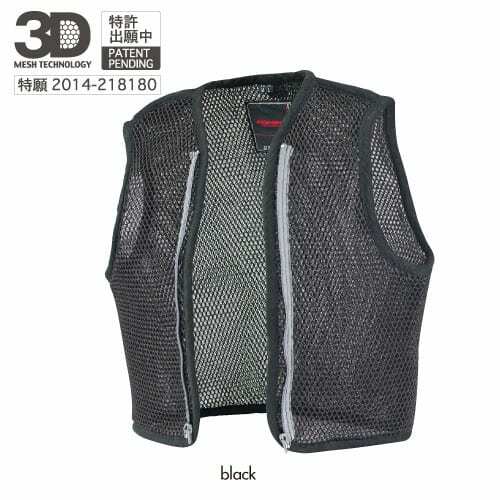 It has vented panels at the front, back, arms and combined with Komine's 3D mesh liner, it can have amazing airflow. The zips on the vents allow you to close them up as the conditions change. This means, with the right liner, it could be a all year round jacket due to its flexibility. The reflective panels and protectors give you the safety you need for you commute. 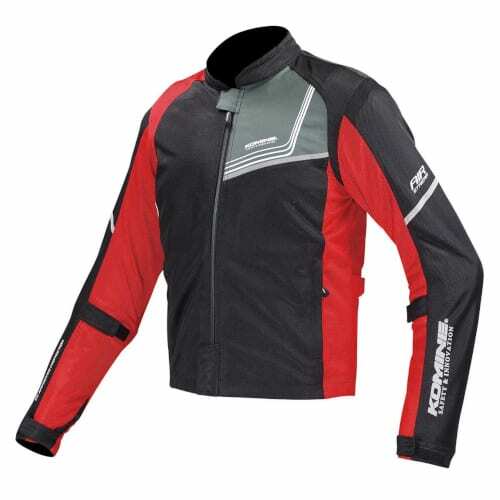 The JK-108 Air Flow Vented Motorcycle Jacket is a great option for someone who wants flexibility in a jacket and ride in conditions that can be unpredictable. Yes Melbourne, we are referring to you. 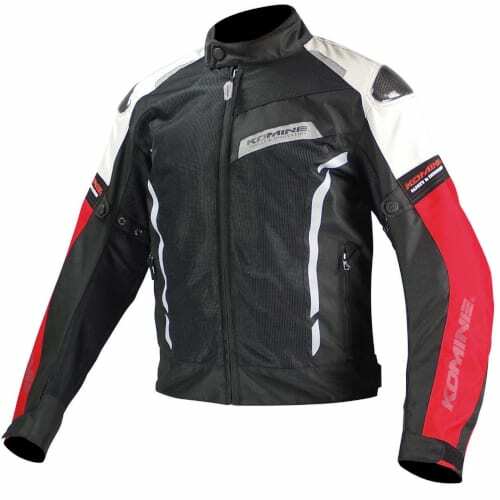 The Komine JK-103 Carbon Protect Mesh Motorcycle Jacket is a lightweight mesh jacket that uses textile on the outside of both sleeves, where strength is required. It comes fully equipped with CE protectors on the shoulders and elbows as well as armor for the chest and back. The carbon sliders on the shoulders give an extra piece of mind as well as reflective paneling to be seen when you need to be. It also comes with 3D pattern for comfort. 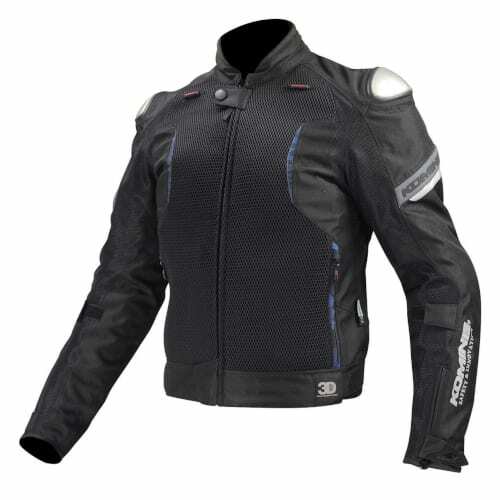 The JK-103 Carbon Jacket is a great jacket for the rider who wants safety and comfort in the warmer months. 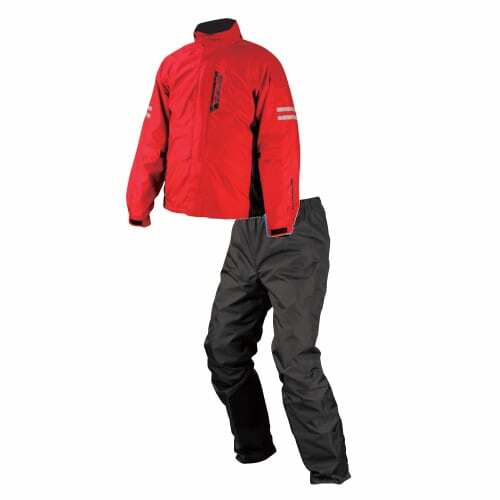 Komine JK-503 Goretex Winter Jacket Deneb Plus is the ultimate riding jacket. 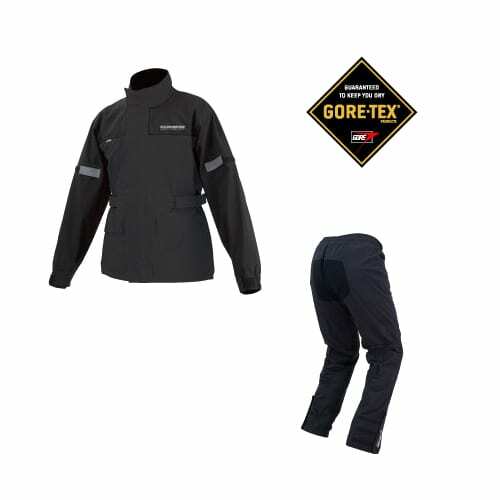 Made with CORDURA material that is light and durable as well as a Goretex 45,000mm windproof, waterproof, breathable membrane to keep you dry all year round. 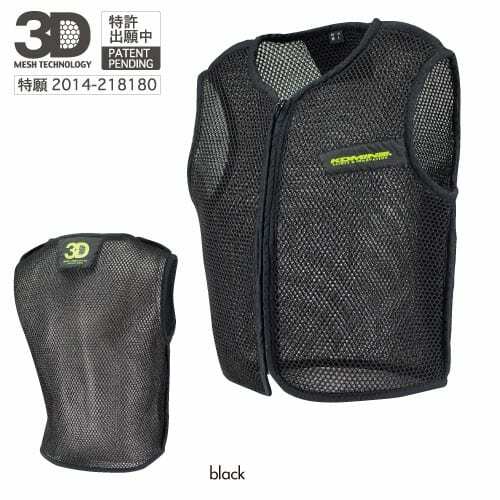 It comes with high-level impact protectors with CE armour in the shoulders, elbows and back as well as protection in the chest. The all weather jacket has zippered vents that can let air into the jacket as well as a removable insulated liner so you can adjust the level of warmth to your conditions. 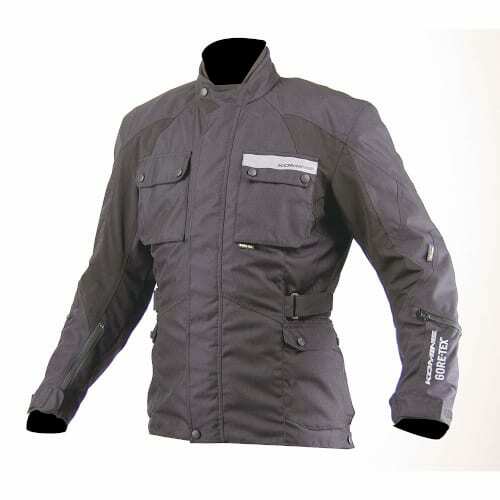 This jacket has reflective qualities and is great for the all weather rider. If you're looking for the ultimate 4 season jacket for touring or adventure riding then the Komine JK-593 Protected Full Year Touring Jacket is for you. 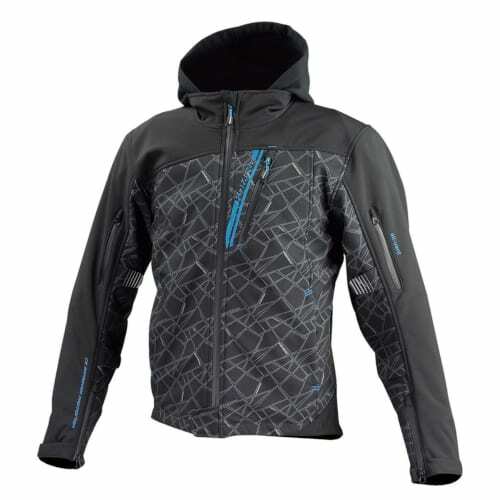 The jacket comes with separate removable waterproof, windproof, breathable liner as well as a heat insulated liner so you can adjust your warmth levels as your conditions change. The zippered ventilation feature and 3d mesh also give you the option to create great airflow when riding on those hot sweaty days. 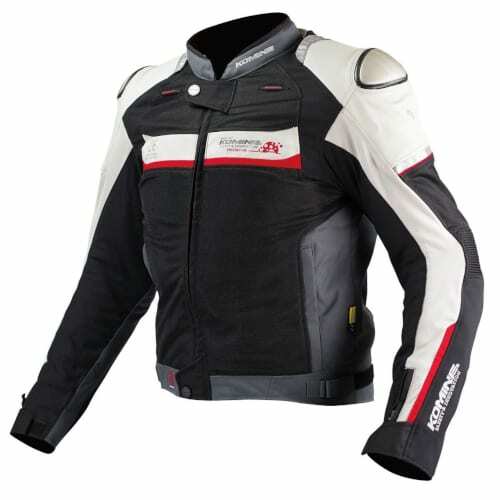 Coming standard with CE armour on the shoulders, elbows and back as well as hard, yet flexible chest protectors this jacket will keep you safe for those many km that you'll clock up on the road. The JK-593 is the supreme option for all those adventure and touring riders out there. Komine's JK-588 Full Year Titanium Jacket is the perfect jacket dealing with all the dynamics the Australian conditions can throw at you without having to compromise on safety. Featuring CE armour on the shoulders, elbows and back as well as chest protectors and titanium outer protectors on the shoulders, which help the jacket achieve its impressive look. It comes with one waterproof liner and one insulated liner that are both removable. The significate amount of vents on the front of the jackets half compliment the 3 stages large vent on the back to cope with the hottest of conditions. With reflective qualities built in this really is an impressive jacket for any serious all weather rider. 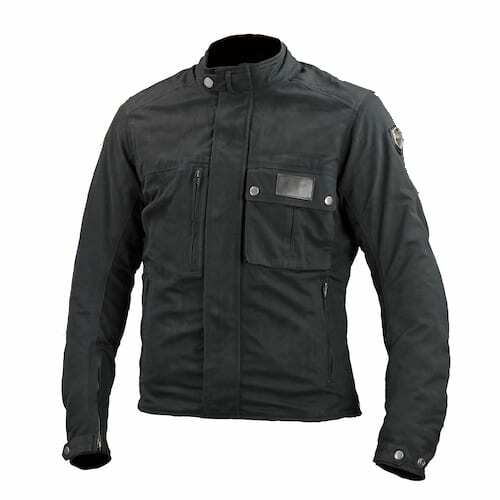 The Komine JK-572 Full Year Motorcycle Jacket GALLIA is a 3 layered setup that allows you to change the setup on your jacket as the weather conditions change. With one waterproof, windproof, breathable liner and one insulated warmth liner (both detachable) included you can add or remove layers as the seasons change. The venting system and 3d mesh , built-in to the jacket, will also give you the airflow you need to keep you comfortable on the bike. 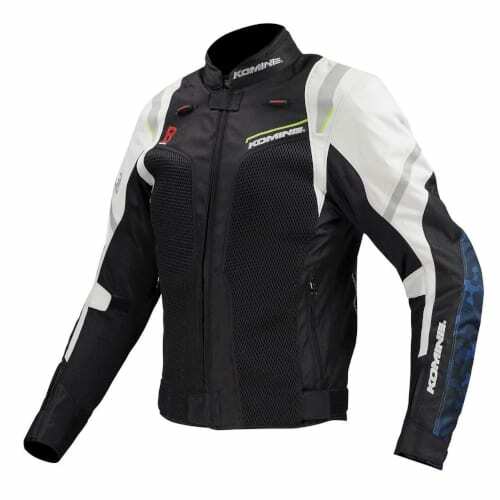 Featuring CE shoulder and elbow armour as well as back and chest protectors, reflective qualities and stretch paneling, this is a great all-around jacket. 4 seasons in one jacket! 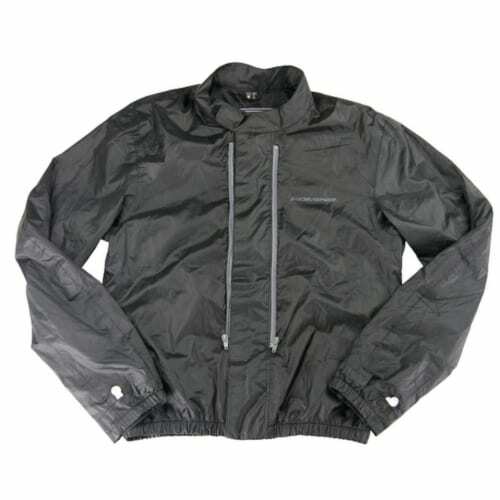 Komine's JK-595 Protect Waterproof Short Cotton Jacket is a neo-retro style 4 seasons jacket that balances a great look and versatility with a high level of safety. The cotton outer shell has a has a waterproof membrane to keep the rain out and also comes with a removable insulated liner to add warmth if it gets cold. 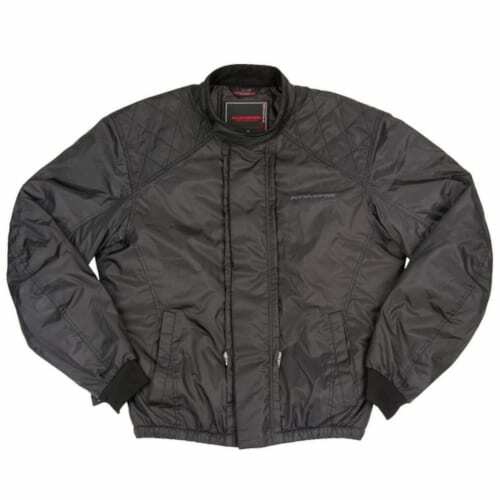 Once the sun kicks in you can open up the zippered vents to get airflow thorough the jacket with its 3D pattern design. The CE Level 2 armour in the shoulders and elbows as coupled with an EVA back protector makes sure that you are covered for impact protection. Practical design whilst looking good can be achieved with the JK-595. If you're looking for a motorbike jacket that keeps you dry and that you want to be seen in then the Komine JK-586 Comfort Winter Jacket is it. It's highly reflective pattern makes the parka look like any other one during the day but as soon as headlights come across your path at night, it lights us so you can be seen. As well as CE approved elbow and shoulder protectors and back protector, the JK-586 hs a waterproof shell and insulated removable liner with zippered vents to get your setup tailored to your conditions. The jacket is perfect for those winter commutes where you want to be seen but still have a casual look while off the bike.